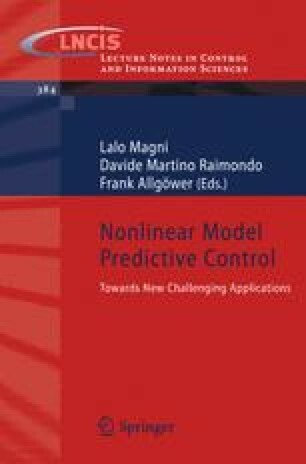 Predictive control is concerned with the on-line solution of successive optimization problems. As systems are more and more complex, one of the limiting points in the application of optimal receding horizon strategy is the tractability of these optimization problems. Stochastic optimization methods appear as good candidates to overcome some of the difficulties. Indeed, these methods are not dependent on the structure of costs and constraints (linear, convex...), can escape from local minima and do not require the computation of local informations (gradient, hessian). In this paper, a Particle Swarm Optimization (PSO) is proposed to solve the receding horizon principle with an application to district heating networks. Tests of the approach are given for a network benchmark, showing that more than satisfactory results are achieved, compared with classical control laws for such systems.